Here’s your “Reboot Schedule” plugin. You can reboot the machine at any schedule without worry. 1. Machines can be rebooted immediately. 2. You can reboot the machines anytime of current day. 3. Weekly reboot schedule can be made. 4. Machines can be rebooted particular days of Month. 5. You have an option to reboot machines on particular date. 6. Machine can be rebooted Last day of the Month. 7. You can save your notes as well. Note: Only one procedure will be activated within 24 hours. In other words, plugin will send only one Reboot command on target machine thru reboot procedures. Reboot Schedule Tab only visible on Windows machines. Don’t forget to provide me your kind feedback. Look forward to testing this one out- thanks!! This is looks pretty good. Any future plans on adding options for Client or Location controls. Would be nice to have ability to schedule the reboots for an client or location....and with the ability to schedule based on machine type (workstation, laptop, server). Also, I am missing the dataviews for the reboot history and schedules. Can you upload them. Thank you. I am already working on the same. Hopefully you will have the 2nd version of it sooner. this seemed to be working pretty great but randomly the reboot schedule tab has disappeared. Have you seen this happen? I know it was taking sometime to reload so i have updated the dll file. You can download the new version from here..
You need to update the plugin from plugin manager. First of i want to thank you for this awesome plug-in, I'm still having issues with the days of the week sticking. So far only the days of the month will stick after I click "save information" When i choose all days for "Days of the week" and click save information then close the box, then open it up again the days of the week are cleared out. Thanks again for your awesome Plug-in its a real treat! check whether the database table named `sankalp_rebootschedule` is exist or not? if not, then re-import the plugin. Let me know if you are still facing the same issue. Thank you Jagjeet, for the quick response! Ill give that shot, and keep you posted. Thank you so much JagJeet, I look forward to any further plug-ins develop! what would prevent the plug-in from working? confirmed that the DB was seeing the changes being made. I am not sure if you're using the right latest version of the plugin. Update the plugin with following dll. if the issues is still present I don't mind to have screenshare on skype or via teamviewer. Using this plugin is causing a 3-5 second lockup / freeze every 30 seconds. Took me a while to figure out that it was this plugin doing it. some how 100 data views were created for history and for schedule. Even though I have multiple servers scheduled and they appear on the 'scheduled' data view, nothing appears on the history data views. I will try to reload this new version. Same problem with the lockup hang freeze here. Every 30 seconds and the duration is based on internet speed. This is only when Super Admin permissions are enabled. Thanks for your feedback on first version.. I have tried to resolve all the issues which are reported to me in 2nd version and hopefully you will have the latest version in upcoming week. 1. Freeze every 30 second. 3. Remove most of the branding. Also, it has nice looking console. You may download the new update here. Update it by going to help-> Plugin Manager. It won't override any schedule that you have already made. let me know if you guys still facing any issue. Feature request. 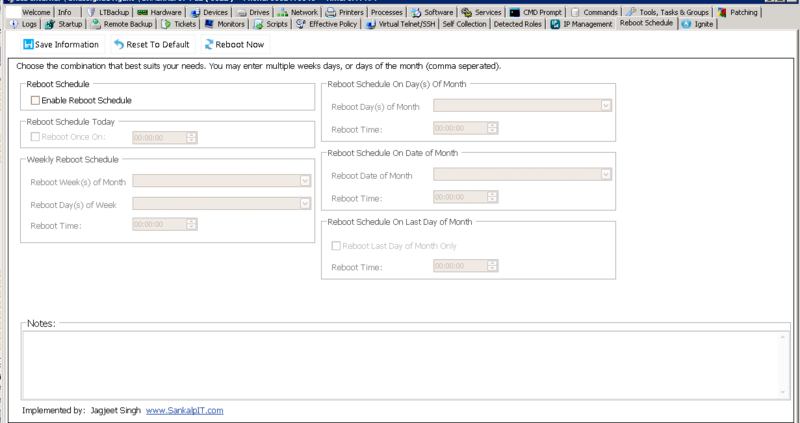 In the dataviews "Reboot Schedule Overview" add a open computer link. The duplication has been fixed. I love the new console look. Thanks for all your work. Perhaps my green-ness is showing... I installed the plugin from my workstation, and restarted the database agent. I do not see the option to use this plugin, so I guess I am missing a step. Cancel, it shows up now after restarting Labtech. Thank you. Having an issue. Some users see this tab just fine, others get a permissions issue when they open Labtech after installing this plugin, and the tab does not show. What needs to be done short of giving a user god mode to make this work? Make the user super admin.. It's fixed now, but the outage and issues coincide exactly with the installation of this plugin. Has anyone else experienced anomalies immediately after installation of the latest plugin? I have removed it, but sure would like to have the function it provides. Just a little scared now after breaking the LT server for a short while.